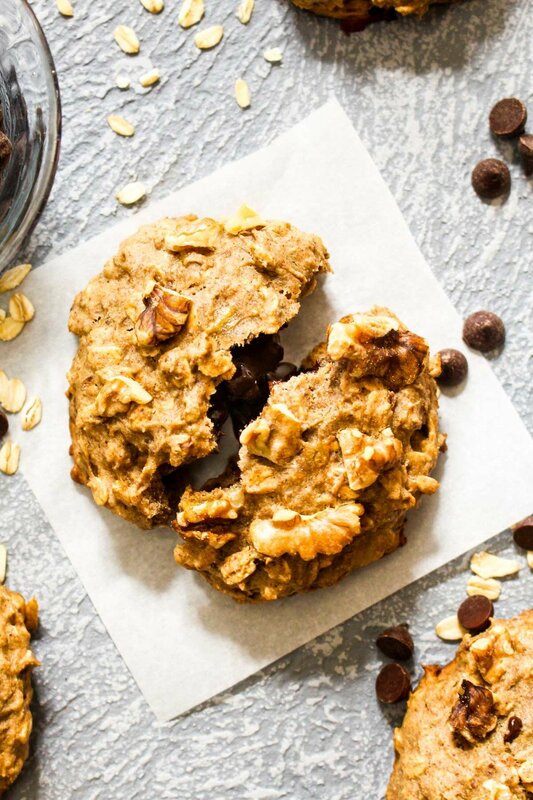 These Chocolate Stuffed Banana Nut Breakfast Cookies are making dreams come true. This recipe tastes like a soft and sweet cookie but is healthy enough to eat for the most important meal of the day. Made with gluten free whole grains and sweetened with banana and a touch of maple syrup. Preheat the oven to 350 degrees. Spread the walnuts out on a sheet pan and toast for 7-10 minutes, or until the walnuts are fragrant and golden brown. Remove from the oven and set aside. While the walnuts are toasting, mix together all of the wet ingredients in a medium bowl. Next, mix together all of the dry ingredients in another bowl. Add the wet into the dry and stir to combine. Add in 1/2 cup of the walnuts and stir until they are evenly distributed throughout the batter. Line the baking sheet with parchment paper. Divide the batter into four even sections. Take half of one quarter and roll it into a ball. Press the chocolate chunk into the cookies and seal it off, making sure to cover up all the chocolate. Repeat with the remaining dough, dividing each quarter into two cookies, so that you have 8 cookies. Bake for 20 minutes, or until the cookies golden brown. Let cool for 5 10 minutes, and serve.